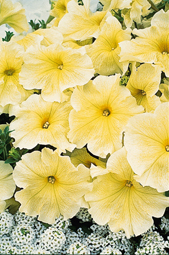 Prism Yellow Petunia is a sunny yellow in the center with a light yellow rim around the outer edge. Petunias have trumpet-shaped flowers that are 2 to 3 inches across. They come in a wide variety of bright colors. Petunias do well from early spring until late fall. In the Fall, Petunias are excellent plants to fill in when you have to replace your summer plants in early September when it is still too warm for Pansies. Petunias are able to handle the warmer weather of late summer/early fall and the cooler weather of mid- to late fall. They will survive light frosts, but the blooms will turn brown. 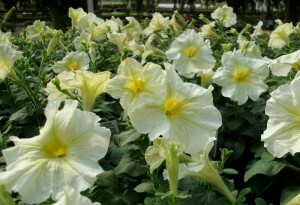 A hard frost will kill most varieties of petunias.